1983 was a pretty fertile year for fictional nuclear apocalypses in Western popular culture. 2019: After the Fall of New York, Endgame, Exterminators of the Year 3000, Stryker, and Le Dernier Combat were released in cinemas, while ABC’s The Day After and Britain’s BBC2 adaptation of 1961 dystopian novel The Old Men at the Zoo, updated to feature a nuclear attack on London, appeared on television. Publishers released a slew of books with atomic mushrooms on their covers, including The Aftermath: The Human and Ecological Consequences of Nuclear War (edited by Jeannie Peterson), Luke Rhinehart’s Long Voyage Back, William Prochnau’s Trinity’s Child, and Dean Ing’s Pulling Through, as well as The Web, that year’s installment in Jerry Ahern’s Survivalist series. All of them attempted, seriously or otherwise—and it was generally otherwise—to examine the effects of a seemingly imminent nuclear war. The Doomsday Clock stood at four minutes to midnight (the closest it had been since 1960, though it was about to move even closer) and two events that year—the NATO military exercise Able Archer 83 and a nuclear attack false alarm in the Soviet Union—almost prompted a catastrophic escalation from fiction to reality. The BBC’s optimism-annihilating Threads was still a year away, but the cultural momentum was building up to a psychological discharge whose blast radius would, for some, obliterate their ability to think about or plan for the future: what was the point, when they would be spending it eking out a life in the radioactive ruins of our civilization (or, if the Italians were right, driving customized cars and dressing like members of Krokus). That momentum surged dramatically with the release of Testament, the high water mark of the class of ’83. British sci-fi and horror magazine Starburst published a short yet positive review of it alongside a single publicity still showing a mother huddled up in bed with her children, fearfully pointing a torch into the darkness—an image that summarized perfectly the fear that it would be in our own homes that we would be killed, if not by the bomb itself then by the stone-age appetites and economics its detonation unleashed. Despite containing no mushroom clouds, no heroics, no fallout shelters, no special effects, no geiger counters, and no enormous doors slamming in the depths of hell, Testament is absolutely devastating: nothing except average people gradually realizing that the rest of their already abbreviated lives is destined to be a grim slog through even more illness, death, and loss than they’ve already experienced. The film, produced by PBS and directed by National Education Television documentarian Lynne Littman, deals with the effects of a nuclear attack on a family who live in an idyllic small town (so idyllic that a young Kevin Costner and Rebecca De Mornay have settled there) somewhere within driving distance of San Francisco, and the first ten minutes is an artfully contrived little précis of their privileged lives: we see mom Carol (the great Jane Alexander) unenthusiastically acting out the instructions on her workout tape from bed while husband Tom (the also great William Devane) blithely takes their reluctant older son Brad cycling, leaving mom to get teenage daughter Mary (Roxana Zal) and little son Scotty (Lukas Haas) ready for school. This initial section of the film highlights the reassuring frivolities and ephemera of Western life—toys, games, sports, exercise, E.T. t-shirts, He-Man figures and Sesame Street, and, in a way, Testament plays peculiarly like some kind of anti-E.T., or at least some nightmarish re-edit of its homely, chaotic, childish motifs, the intruder into the suburban calm not a kindly alien botanist but something native and altogether less friendly. There is almost no buildup to the nuclear attack—no news reports about the mobilization of the armed forces, no preparations for shelter. The only indication that an attack is coming at all is that the nature of the film indicates that it must be, and the lack of narrative preparation makes the viewer’s stomach sink even more violently when the cartoon the family children are watching in their sunny lounge is suddenly replaced by static, which is then replaced by an emergency warning transmission. When the attack itself comes, it’s not even a noise, just a silent flash of blinding light. There are none of the typical signifiers: no models are destroyed, there is no colorized stock footage of shacks being blown away by 1,000 mph winds, no flesh drooping from bones, no radiation sickness makeup—only confusion, then coffins, and then funeral pyres. As the broadcasters who exchange news with the town’s chipper old radio ham start to vanish one by one, awareness grows that this might really be it—there might really be no hope. The locals pull together and, unable to believe that the wider world won’t rally, seem determined to struggle through, organizing mutual assistance and continuing with their little world of school plays and piano lessons. But it gradually becomes more and more obvious that there is going to be no struggling through this one. Things are not going to return to normal—they are just going to keep getting worse, and there won’t be any school plays when all the children have died and all the adults are busy building bonfires to burn their corpses on. The delicacy of touch with which the proceedings are handled—director Littman got the rights to the source material, a 1981 short story by Carol Amen, after reading it with her son—means that Testament makes its point all the more forcefully. Yes, very occasionally the tone does get slightly preachy, but considering the point the film wants to make—the stupidity of slowly and agonizingly killing half of the population of the planet—it’s a forgivable blip. In any event, Testament never feels smug or self-righteous: there are a few things that jar, and others that produce the odd smirk (a display of priestly affection very unlike that in Thorn Birds, a TV miniseries that caused a scandal the same year that Testament was released), but, most of the time, the viewer is simply staring at the screen in dread. With its calm tonal palette and inoffensive James Horner score, suggestive of TV movies about domestic tragedy on the scale of divorce or alcoholism, one can imagine a grandparent of any political persuasion sitting down to watch it. In terms of production values, Testament sits somewhere between that well-made TV movie and a feature film proper, and its artlessness and lack of pretension, make it, if anything, even more upsetting and disorientating when things start to get really awful. 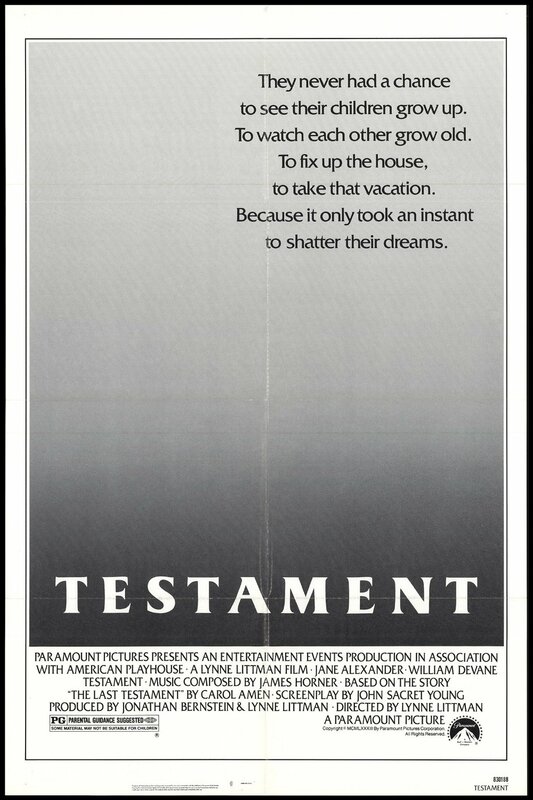 Handled with a little less sensitivity and compassion, it could easily have been mawkish; but it isn’t, and Testament refuses to underline any particular aspect of the situation. There is simply the grind of life getting worse and worse until it is intolerably awful and you cannot survive. The economy with which the characters are sketched lends them a blank credibility, and the absence of any of the iconography of nuclear war (not even a single radioactive symbol) only adds to the film’s power. Throughout the film, motifs of recording and repetition recur: family super-8 movies, nursery rhymes, the exercise cassette that mom is playing at the beginning, the answering machine, the pre-recorded warning message, the journal that Carol starts writing at the beginning of the film, even the roles of priest, mom, and policeman. It is when the graves turn to funeral pyres that the gravity of the situation becomes obvious, and perhaps the point is that the repetition and formalization of daily life is life. Deprived of the batteries and security and hope that allow us make those repetitions, the life we know ends as the recordings wind down. One very touching moment, when mom and son dance together to a (not very good) cover of the Beatles’ “All My Loving” played on a battery powered recorder, underlines perfectly the finite nature of the technologies we use to remember who we are. The film is dotted with such lovely little scenes, like the one where Brad takes his late dad’s bike from the garage after his own has been stolen, and another when Mary asks Carol what it’s like to make love. Nobody is blamed for the war, and there’s no mention of politics, or enemy countries, or presidents. By definition it is probably a left-wing film (Amen’s original story appeared in feminist magazine Ms.), at least in as much as it aims to affect the opinion of the viewer as regards the effectiveness of a nuclear deterrent, and it is conceivable that to some particularly ideologically-driven idiots at the time it may have looked like liberal hand-wringing. Testament isn’t perfect, but it is a powerful and economic piece of drama about personal loss and mass death that eschews all spectacle and seems to have no particular axe to grind other than to ask: What is the conceivable purpose of all this misery? It’s a point that bears repeating. Caught this on a movie channel very late at night…though it was absolutely engaging. The slow erosion of life was heartbreaking– I remember the description the mom gives of the neighbor boy who they take in “crawled off to die somewhere.”–like an animal. I’ve been catching up on articles that I’ve missed through your recent retweets. This was a fascinating piece. I watched several of these type of movies back in the mid eighties. “Damnation Alley” stands out the most vividly in my memory but I also remember watching “The Day After” and “Amerika”. I watched them with my mother and would ask her questions about the meanings of various things that would happen. I don’t remember my younger brother being present too often, most likely he was playing games on his Sega. He must have been present for some of them because for a while he had vivid nightmares about nuclear war and even wrote a letter to President Reagan that received a form letter response. My point is that these movies could have a significant impact on the viewing public and it very interesting to read these pieces as you revisit them with a 21st century eye.